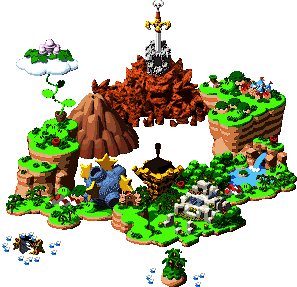 Mushroom Way is a short path that extends from Mario's Pad in the west to the Mushroom Kingdom in the east in Super Mario RPG: Legend of the Seven Stars. Mushroom Way consists of three small areas. From west to east, the first is a short, winding, dirt path surrounded by trees and hills and inhabited by small groups of Goombas and Sky Troopas. There are two Treasure Boxes, each one contains several coins. In addition, the first time Mario goes through this area, Toad is ambushed by a Goomba. If Mario saves him, he receives a Honey Syrup. Heading to the northeast from there, the next area is more open. More grassy, though still covered with dirt, it has a few short, rocky hills scattered on it. The same enemies live there, and plant life is fairly plain, though there are a few large blue flowers solid enough to stand on, and, remarkably, a red one that spins. What appear to be palm trees grow in small groups around the area. Mario can jump up onto the rocky hills from the Spinning Flower. On the west hill is a box with a Flower inside. The north hill hides a Goomba, and the right hill has a Sky Troopa gripping Toad in its talons. If Mario beats it, Toad will give him a Flower Tab. There's also a chest in the southeast corner of this area with a Mushroom that will restore all his HP and FP. The third and final area, east of the second, is the largest of the three. Vegetation is closer in appearance to the first area than the second, and other life is different from both. It is inhabited by a lone Lakitu which drops Spikeys. 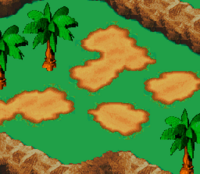 There are also two Spikeys already on the ground here, and if Mario fights them, they sometimes appear with a Sky Troopa. The area widens into a small field in the east. The exit leading to the Mushroom Kingdom was once guarded by the Hammer Bros., who would attack anyone who dared come near, but they were eventually beaten by Mario, freeing the area. This page was last edited on March 31, 2018, at 08:43.